Brandon University Kids Day at the Royal Manitoba Winter Fair is Thursday. Tens of thousands of visitors will be treated to a warm blue-and-gold Brandon University welcome as they stream through the gates of the Royal Manitoba Winter Fair on Thursday, March 29, as BU hosts Kids Day at the Fair. 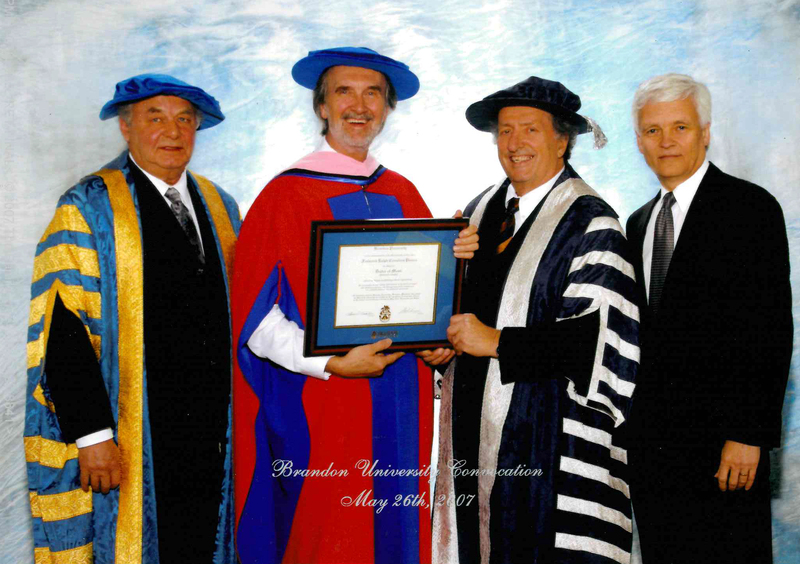 Fred Penner, at centre left, receives an honorary Doctor of Music degree at BU’s 2007 Convocation. From left are: then-Chancellor Ed Schreyer, Fred Penner, then-President Louis Visentin, and then-Board of Governors chair Jake Janzen. Along with a full day of horse shows, agricultural education and exhibitors, BU Kids Day at the Winter Fair will feature renowned family entertainer Fred Penner, who received an honorary doctorate from BU in 2007. Additional family entertainment on Thursday will also include Juno-award winner Norman Foote, stunt ventriloquist Tom Holland, Doodles the Clown, and the perennial favourite SuperDogs. Adding to the fun, Brandon University mascot Bailey the Bobcat will prowl the Keystone Centre, handing out high-fives and posing for photos with fans. Kids Day at the Winter Fair is a natural fit for Brandon University, which welcomes students of all ages to campus. The Royal Manitoba Winter Fair is one of Westman’s largest events, and draws attendance from a very wide area. An extensive presence at the Winter Fair allows Brandon University to cultivate important connections with industry, alumni and the broader community. Brandon University Kids Day gets underway at 7 a.m. on Thursday, March 29, with the Hunter Jumper Horse Show in the Westoba Agricultural Centre of Excellent. Shows in the Westoba Place Main Arena begin at 9 a.m.
Fred Penner’s shows are in the BU Kids Day Amphitheatre at 1:30 and 4:30 p.m., with plenty of other family entertainment throughout the day in the Amphitheatre and in MNP Hall. The ATCO Cup and other shows conclude BU Kids Day that evening in Westoba Place, beginning at 6:30 p.m.
Brandon University volunteers will be wearing BU T-shirts and will be positioned throughout the Keystone Centre to greet Winter Fair attendees and hand out Homecoming stickers. Look for the BU booth for more information and free draws.